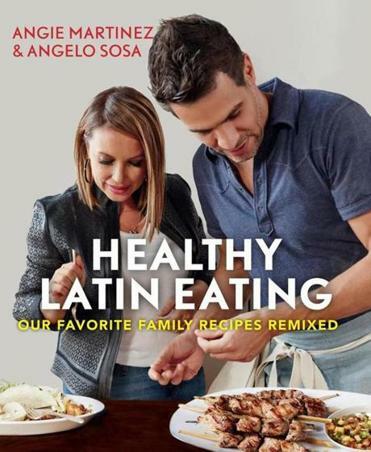 “Top Chef” alum Angelo Sosa and New York radio host Angie Martinez co-wrote the “Healthy Latin Eating” cookbook. Longtime New York radio host Angie Martinez loved the empanadas, chicharrones de pollo, and other Puerto Rican dishes that she grew up eating. But as Martinez, born in New York of Cuban, Dominican, and Puerto Rivan heritage, focused on preparing healthier food for herself and her son, she found they were eating Latin dishes less frequently. “I got to a point where I didn’t want to eat a salad every day or a piece of grilled something. I wanted to eat some of the food that I loved and not worry,” she says. Q. What are your experiences of growing up eating Latin food? Sosa: I have great memories of my tia Carmen, my Dominican aunt who passed away over 20 years ago. There was a lot of soul to her cooking and a lot of soul to my cooking. Those recipes from the past don’t have to die with the past. They can evolve and grow to something healthier and more vibrant. Martinez: I love that old Latin food. I grew up on it. My family cooked it. But I got to the point where I only ate it on occasions like holidays. I was always watching my weight and that food wasn’t in line with that. Not only is quinoa super high in protein, it’s really delicious. Q. How did you get together to work on the book? Sosa: We met through a mutual friend. I knew Angie had this idea of a healthy Latino cookbook for a long time. Martinez: I just really didn’t want to put something out that was just my recipes that are kind of OK. I wanted it to be great. That’s when somebody I knew set me up with Angelo. They said Angelo might be interested. Luckily he was. Q. Is it hard to convince people to switch to healthier versions of familiar dishes? Martinez: I’m not trying to trick anybody. It’s going to taste amazing and you’re going to get the essence of what you’re accustomed to without that guilt. Sosa: I think the proof is in the pudding. If they closed their eyes and just tasted the flavors, they will take you back to Cuba, the Dominican Republic, or any Latin country. Q. How do you create those familiar flavors while making things healthier? Martinez: Angelo is so amazing at putting things together that you wouldn’t necessarily expect: the surprise of ginger when you don’t expect it, or a jalapeño when you don’t expect it. I’ve learned a lot from him. Sosa: It’s what I call the holy trinity. Three flavors all working at once but harmoniously. A flavor profile could be sweet, sour, salty, or sweet, bitter, umami, or smoky, earthy, sweet. We’re extractors of flavor. We’re about bringing flavor to the forefront. Q. What are some recipes from the book for winter? Sosa: There’s a sancocho, a Dominican recipe my tia Carmen cooked, this beautiful warming stew of vegetables. There are beans and plantains in there, tomatoes, carrots. There’s our take of an arroz con pollo. 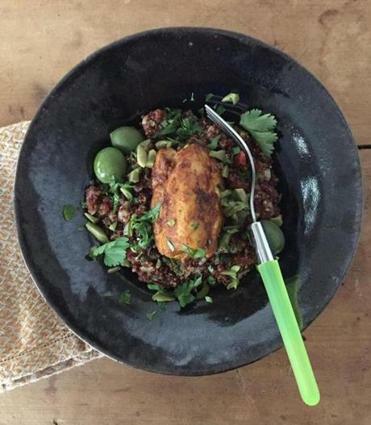 We added a quinoa con pollo. Not only is quinoa super high in protein, it’s really delicious. Q. Do you have a favorite dish? Martinez: Our cucumber-pineapple salad. It’s a little sweet and he puts jalapeño and mint in it. It has all this amazing flavor in a healthy salad. We eat the empanadas all the time. That’s something my grandmother makes every Christmas Eve and on Easter. She fries them. We’ve figured out a way to bake them. Q. Were the friends who contributed recipes already on board with healthier eating? Martinez: Fat Joe, who’s a really good friend of mine, is a rapper who lost 80 pounds. I was at his house and his wife was making Latin food, but she was grilling the chicken and using brown rice. As a community, we’re trying to eat better and as a community we’re connected to this food. Q. What do you think the grandmothers will say when they read your recipes? Martinez: The grandmas might not be ready, although my grandmother has been pretty receptive to some of these recipes. I took that pineapple salad to my grandmother’s on Christmas Eve. I thought they’re going to think it’s too fancy. It disappeared. I should’ve made two trays.